Meet The Boma – Dinner & Drum Show’s New Head Chef! The Boma’s new head chef, rising star Brighton Nekatambe, has represented Zimbabwe internationally, and gained valuable culinary experience both at home and abroad. He descends from a long line of Nambya chiefs, and with three of his siblings also chefs, cooking, too, is in his blood. Please give us your brief history? I was born on the June, 12 1983, in Hwange into a chiefdom family in the Nambya tribe, the Nekatambe chieftaincy. My grandfather is the current Chief Nekatambe. I am now 34. I did my primary schooling at St Ignatius then my secondary education at Gebhuza High School, completing my A’ Levels in 2003. I started my apprentice chef programme with Victoria Falls Safari Lodge in 2005, and completed it in 2007, attaining a National Certificate and journeyman class 1 chef card. I continued with my studies with the School of Hospitality from 2010 to 2012 and attained a Higher National Diploma in Culinary Arts. I also attained a Diploma in Hotel Operations with the British college of Professional Management. It all began at Victoria Falls Safari Lodge (VFSL) where I worked as a kitchen porter in 2004 before enrolling as an apprentice chef the following year. I have been in the hospitality industry for about 13 years, after starting as a kitchen porter in 2004, and then joining the apprentice chef program in 2005 with VFSL. I completed this in 2007, and worked as a class 1 chef until 2008. I was later promoted to chef de partie in The Boma kitchen where I worked until 2010. 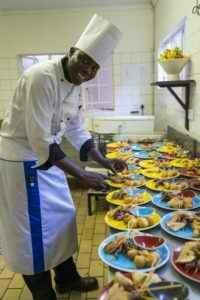 I joined Rainbow Tourism Group as a sous chef at A’ Zambezi River Lodge for two years, before joining African Sun at Elephant Hills Hotel as the senior sous chef, and was later promoted to head chef at Caribbea Bay Hotel in Kariba, a position I held until 2015. I then had the opportunity to go to Italy and represent Zimbabwe at the World Food Expo in Milano for five months, and I was also attached to Calista Luxury Resort, in the Turkish tourist town of Belek, in the Antalya province. I later returned to Zimbabwe, joining the Hwange Colliery Company until November 2016, when I took up my current position at The Boma. I represented Zimbabwe at the Nelson Mandela Culinary Challenge in South Africa 2013, winning a gold medal. I was also voted African Sun Chef of the Year in 2013. I returned to South Africa the following year to represent Zimbabwe in the African Cup Culinary Challenge, which is a World Association of Chefs’ Societies approved competition. I was inspired by my late brother Abednico Nekatambe, who was also a chef, and he worked at Victoria Falls Safari Lodge’s (VFSL) MaKuwa-Kuwa Restaurant as a senior sous chef, and at the time of his passing he was The Boma head chef. 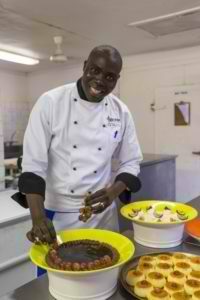 In fact, two of my other brothers, Trevor Nekatambe and Conrad Nektambe are also chefs, so it is in the family! 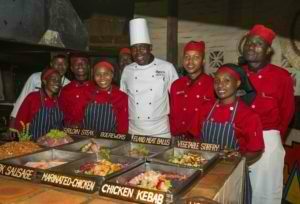 Chef Brian Ndlovu, and current VFSL Resort Executive Chef Chef Munyaradzi Zariro have also inspired me. They are my mentors, as are the chefs who trained me to be the chef I am today. Imparting skill and knowledge to other chefs, thus maintaining a high food standard and quality. I also enjoy coming up with new ideas and implementing them. What has been your biggest contribution in your current role? The implementation of new ideas and maintaining food standards and quality. I’d like to attain a Bachelor of Technology degree in culinary arts; be a culinary guru with a vast amount of knowledge on new trends; I’d like to be an executive chef; and also to own a beautiful house in a medium density suburb. What makes your position so interesting? It allows me to deal with chefs at different levels, hence imparting both practical and theoretical skills to them. My position also allows me to come up with new ideas, implement them with my team, monitor and maintain them. I am married to Charity Nyamhondoro and we have two boys – Jaiden, who is four, and Keith, who is one. What advice do you have for those wanting to enter the hospitality industry? You really need to have a passion and love for the industry, and this has to be the drive to join it. Without this passion, zeal and love for it you are likely to quit or to tire of it.